Voted Winner at the 2018 New Zealand Monumental Masons Associations Conference in Rarotonga for the best Upright Memorial of the Year and the Supreme Award for the best of the best! Guardian Memorials is proud to announce that at this years New Zealand Master Monumental Masons Association conference in Rarotonga, our fully customised scaled replica of a 1910 Model Ibanez Guitar with red Granite and white Marble Inlay's, coupled with stainless steel strings, tuners, tremolo, dials, pickups & bridge - was voted the best 'Upright Headstone' for 2017-2018. The same memorial was also voted the 'Supreme Award' for 2017-2018. Guardian Memorials is committed to providing outstanding service and creative workmanship - using both modern techniques, alongside the traditional methods. Guardian Memorials has an extensive range of headstones, monuments and plaques with a huge range of designs readily available, more than 2000 designs and counting daily. If you are after something unique we will work with your ideas to design and create a unique memorial, with a view to exceed your expectations. We have an in depth knowledge of each local cemetery's rules and requirements and make it our mission to ensure we take care of all the 'behind the scenes' duties & paperwork to make your experience as easy as possible for you. Our work is created to fit into any local or national cemetery and we specifically enjoy working with our Pacific Island families and send memorials back home to the islands, GST free. Guardian Memorials is proud to be a long standing member of the New Zealand Master Monumental Masons Association (NZMMMA). We are also very proud to be part of the Headstone Shop co-operative. 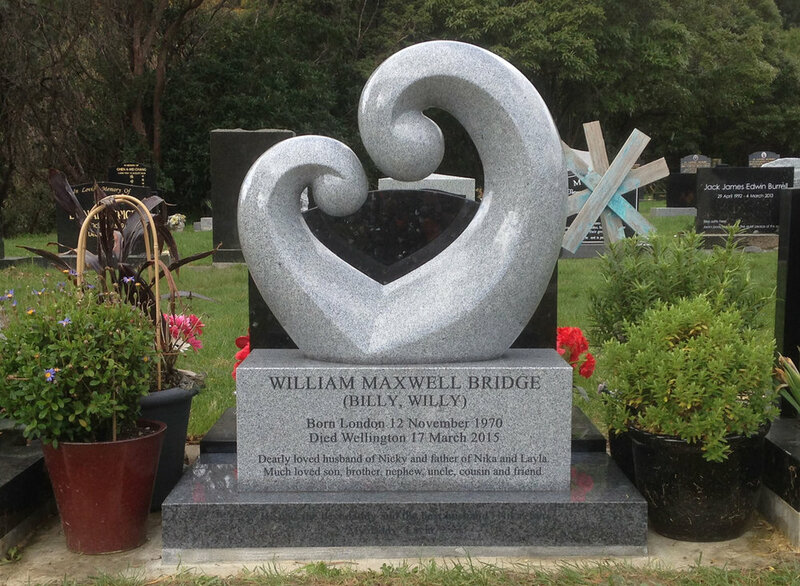 The Headstone Shop is a nationwide collective of experienced and genuine stone masons, all of whom are family owned and operated and spread right across New Zealand. We are unique in that as a group we share ideas, techniques and designs which ensures we are constantly up to date with fresh new concepts in our industry. Headstones, plaques and monuments range from simple to detailed, unique and customised - and everything in-between. Our team will work with you to discuss all the different options and help you decide what's right for you. Our aim is to make this experience as easy as possible. Our team are experienced in restoring and renovating headstones, graves and memorials. Restoration can be as simple as a thorough clean & inscription restoration, to a full restoration which can involve lifting sunken graves and re-setting fallen or broken headstones. It's also our privilege to work on the cleaning, maintenance & restoration for many of our fallen soldiers war graves & headstones through our close relationship with the Ministry for Culture and Heritage over the years.